You might think that your worst nightmare would be entering a toilet and leaving it smelly when you are at someone’s house. Wait until you are done doing the business just to realize that the toilet is blocked. So you are looking down at the toilet bowl hoping that the waste will go down, but instead, it starts coming up. Oh, and it’s not just the water that is coming up at the speed of a bullet. The bowl needs to stop filling, and you need to do it FAST! The moment you realize that the toilet bowl might overflow or will overflow, you need to make sure that you stop the water supply. Now you may ask; how can I do that? Well that is pretty simple. Take off the tank’s lid quickly and reach for the toilet flapper. The flapper is usually at the bottom of the tank which releases water from the tank into the bowl. Close it as quickly as possible so the toilet bowl doesn’t overflow. Now you flush the toilet once to see whether the water and waste passes through or not. If you think that the toilet might overflow. We would suggest that you keep one hand on the flapper and slowly flush the toilet. If the water rises instead of going down, close the flapper and leave the flush handle. Most people think that all plungers are the same and they are all supposed to do the same thing in the same way. We hate to break it to you but all plungers are different and they also perform differently. Reach for a plunger that has an extended flange or commonly known as the funnel cup plunger. This one has better seal and unclogs the toilet quicker than a regular plunger. A lot of people don’t know this but a stiff rubber plunger won’t work as efficiently as a soft one. 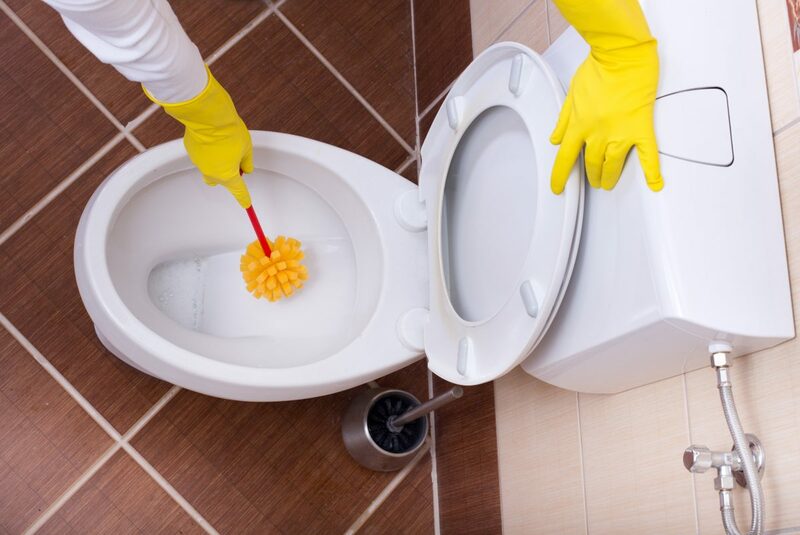 The easiest way of softening the plunger is by running it through hot water. A softer plunger will give a better seal. People usually focus on pushing the plunger downwards; they often forget that pulling it back correctly is equally important. Fix the plunger and use it as a seal between the bowl and the blockage. Push the plunger and up and down vigorously for a couple of minutes. If the water clears it means that your work here is done, if it doesn’t continue to do for a couple more minutes. If in case the blockage doesn’t clear after all the hard work, this trick will surely get the toilet running. Pour a good amount of dish wash liquid detergent and let it sit for a few minutes. Once it settles on the floor pour hot water over it and flush late. Remember you can always call a plumber when you think you won’t be able to handle the situation.